A topic name to subscribe to in the MQTT Server. An optional read transformation to select part of the topic value. 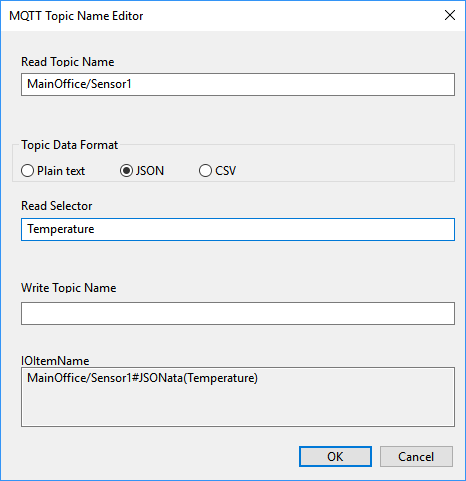 An optional write topic name to send publish messages to the MQTT server. MQTT IOItemName Editor - the editor for MQTT IOItemName properties. MQTT IOItemName Format - the format of the IOItemName field when used with the MQTT Connection Tag. To open MQTT I/O Item Name Editor Dialog, click the Browse button at the right side of the IOItemName field. Read-Topic-Name is the name of the topic used to read data from the MQTT Server. The Fernhill SCADA MQTT driver will subscribe to the topic specified by this name. Read-Transform is an optional Text Selector to select part of the topic value. Note: When the transformation is not specified, the tag is mapped to the entire topic value. Write-Topic-Name is an optional topic name that receives publish requests from the Fernhill SCADA. Note: When not specified, write requests are published using the Read-Topic-Name. The driver subscribes to the topic 'Home/Basement/Light1'. Values published by the MQTT server using this topic name update the value of the tag. The entire value of the topic is used. Write requests from Fernhill SCADA are published to the same topic name 'Home/Basement/Light1'. The driver subscribes to the topic 'Home/Basement/Lights'. The value of the Light3 element is used to update the tag value. Write requests from Fernhill SCADA are published to 'Home/Basement/Lights/Light3'. To learn more about the lightweight Java Script Object Notation (JSON) transformation language.